Kalajoki is home to a variety of interesting cultural attractions. Here are a few examples. 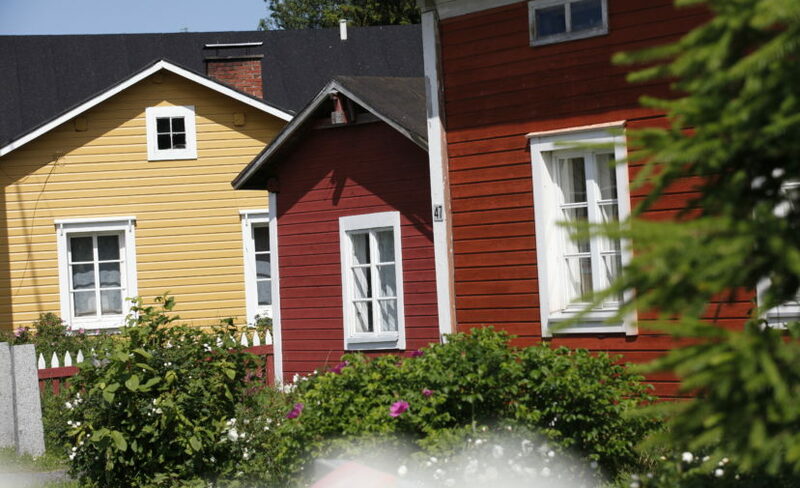 Plassi, the old town of Kalajoki, is well worth a visit thanks to its village setting and museums. In Plassi, you can visit Havula, the Art Nouveau villa of sawmill owner Oskari Santaholma, a small fishing museum or the studio and exhibition of Glass Designer Heikki Ulvi. Visitors can come and enjoy the atmosphere of the main street, riverside and old wooden houses. You can book guided walking tours of Kalajoki’s Plassi via Kalajoen Matkailuoppaat (Kalajoki Tourist Guides) at 050 536 5519. Located in the central part of the Bothnian Bay, the Rahja Archipelago is gradually rising from the sea as a result of post-glacial rebound. In fact, most of the archipelago’s natural features are related to post-glacial rebound, making the area unique on a European scale. In Rahja, you can find the natural habitats of the archipelago, from the sheltered forests of the inner archipelago to the islets on the edge of the open sea. The Rahja Archipelago, with its landing places and campfire sites, provides a comfortable and sheltered destination for one or two-day kayaking trips, for example. Traditional archipelago culture can be found in many places in the form of fishing villages, flowering meadows and woodland pastures. Kallankarit, i.e. Maakalla and Ulkokalla, are two islands located in the Bothnian Bay, 16 kilometres off the coast of Kalajoki. The islands still house a fishermen’s base, and they are popular travel destinations in the summer. In addition to their nature, another special feature of the islands is their self-government, with the Islet Council being the highest authority. The self-government dates back to the period when Finland was under Swedish rule, and it is based on a hamina-ordning (port regulations) issued by King Adolf Frederick in 1771, giving fishermen the authority to govern the islands. The Islet Council convenes annually on the Sunday closest to 25 July. Boat trips are organised to Maakalla every summer on a regular basis: by motorboat from Keskuskari in Hiekkasärkät (Kalajoki Sand Dunes), and by the two-masted Galleass Ansio, owned by the Plassi Village Association, from Konikarvo Harbour in Rahja. Trips are also arranged by reservation to the Ulkokalla lighthouse island. More information on these trips is provided by Kalajoki Visitor Centre and Plassi Village Association. Kalajoki Visitor Centre is the number one destination of visitors to the Bothnian Bay, located in the centre of Kalajoen Hiekkasärkät (Kalajoki Sand Dunes). The visitor centre provides tips regarding the best destinations around the clear-watered and vast Bothnian Bay. At the exhibition, you can dive into the underwater world of the Bothnian Bay, meet prominent figures from the history of our northernmost sea or catch the Finnish record fish. The fishing community’s first church was built in Maakalla in 1680, but the current octagonal church designed by Simon Jylkkä-Silvén was completed on the island in 1780. The church was renovated in 1952, and it has been repaired several times since then. This red-brick church was designed by Architect F. W. Lüchow and completed in 1879. It is the seventh Kalajoki Church. All of the previously built churches were destroyed in fires, and the wooden parts of the current church were also destroyed in a fire in 1930. The church was reopened after repairs in 1931. The construction work was carried out by parishioners and even the bricks were made in Kalajoki. Kalajoki Church is part of the road church network. The bell tower of Kalajoki Church was completed in conjunction with a church that was built in 1815, with Church Builder Heikki Kuorikoski serving as the building contractor. The bell tower survived a fire ignited by lightning that destroyed the church in 1869, and it remains in use to this day. The wooden Rautio Church was completed in 1800. It was built by Church Builder Simo Jylkkä, i.e. Silvén, who was from Kalajoki. Rautio Church and its bell tower were the last construction project he completed before drowning in the Kalajoki River. The church is a cruciform church with transverse arms shorter than the main room. The church can seat up to 370 people. The church was lined and tarred on the outside in 1835. In 1881–1884, a new roof and tower were built for the church. In conjunction with these alterations, the interior space of the church was raised by almost a metre. The most recent renovation and painting of the church was carried out in 2000. The church’s main stairs were replaced in 2006. The church, bell tower, mortuary and outside storage building were painted on the outside in summer 2010. The current church is the first church of the Himanka parish. The church was originally supposed to be built in Parkas in the village of Rautila, approximately 6 kilometres north from the church’s current location. However, the church was built near the Raumankari market place, and the village of Himanka formed around this location. The church was completed in 1794. Jacob Rijf served as the architect, but the practical construction work was led by his brother Carl. The layout of the church is a cruciform with chamfered inner corners. The church’s appearance changed substantially in 1897 when the heavy tower was extended and the shape of the upper part of the windows changed. Himanka Church is part of the road church network. The two-tiered bell tower was completed in 1822. The bell tower holds two bells: a large bell cast in Stockholm in 1794 and a smaller one cast by the Helsinki-based Osberg & Baden in 1860. Tapion Tupa is a dining, conference and vacation centre located in Kalajoen Hiekkäsärkät. It is built on old values and designed to be cosy but modern at the same time. The dining halls of Tapion Tupa feature a permanent sales exhibition by Ylivieskan alueen Kuvantekijät (Ylivieska Area Artists’ Association). The upper floor of Tapion Tupa houses an exhibition space that features changing exhibitions year-round. Tapion Tupa also houses an exhibition on forest culture by Alnus ry. Iso-Pahkala Ceramics Workshop and Seili Cafeteria – an art and ceramic shop with a cafeteria that also offers lunch. Guided tours of the production facilities as well as work demonstrations are available to groups. Work demonstrations are also available in Swedish and English. Tyngän Mylly (Tynkä Mill) was founded in 1916. The mill is still used today and the building also houses a flour store/cafe. The mill is open Mon – Fri 8 am – 4 pm. Kivitupa Gallery is a charming place to visit in the summer – an old stone block building in the middle of a rural landscape. At the gallery, you can view paintings by Artist Sanna-Pauliina Heikkilä and visit the studio and shop.